g with my circle tray cards. I’ll give up soon, as I really want to work on my split-photo mini from last week. 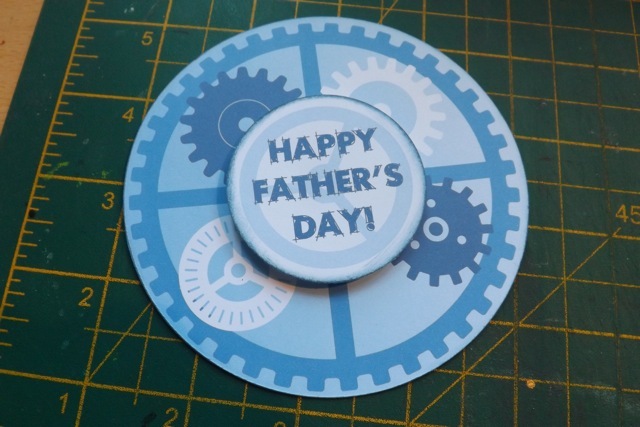 But I know Father’s Day is coming up, and I was interested in seeing if I could use the basic template and some downloadable patterns to create a printable card that wasn’t all vintage and flowery, like the one from Sunday. 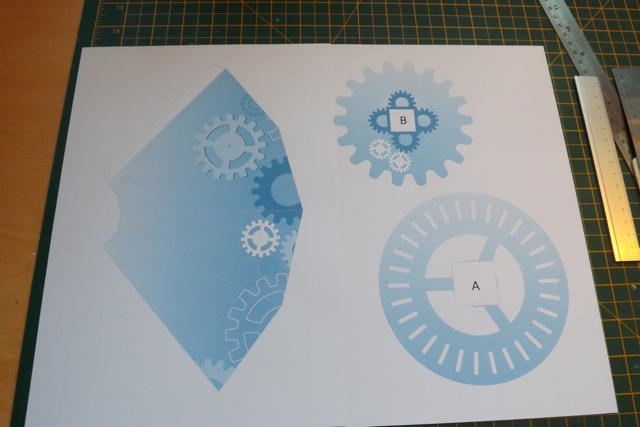 The pattern is from Background Labs and the gears from the SVG I’ve linked to before. 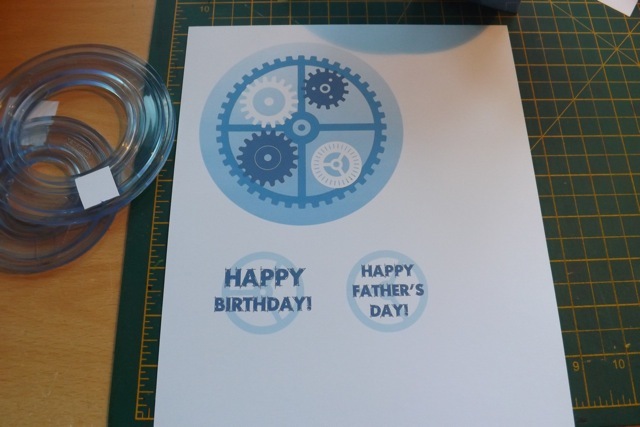 Although this is designed so all you have to do is print and cut, you can certainly use your cutting machine to cut the SVGs and add loads of little gears over the printed bits, in silver or gold or maybe dark blue or white. 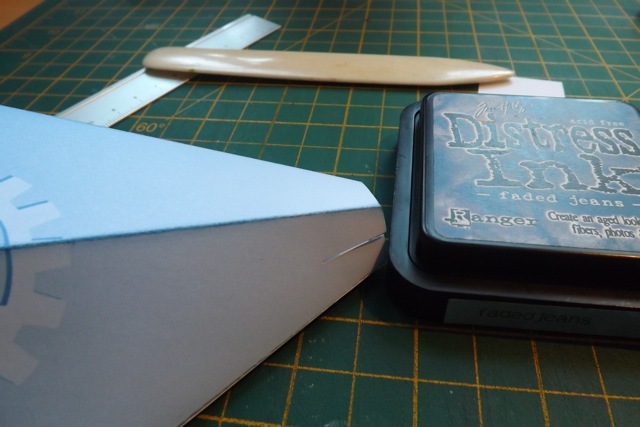 The PDF has four pages – one is the base, one is the two shelves, one is the topper with a punchable sentiment and two card-front toppers, and there is a sheet that will (I hope) print on either A4 or US letter so it can be folded and trimmed to make a 6 x 8 card. You’ll have to experiment with that, but if it doesn’t work on your printer, with your size paper, just print it and cut out the image then add that to a standard 6 x 8 card blank. I would create the little pocket on the inside of a 6 x 8 inch card like here and then just add the topper. 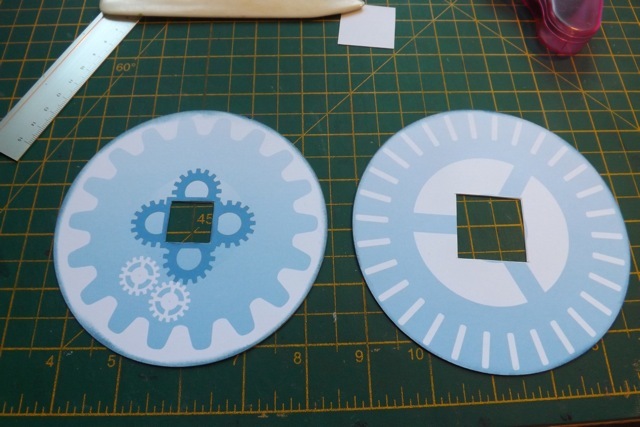 I used the bigger one with a cardstock circle behind it, but the smaller one with lots of gears would look cute too. Cut out the elements. 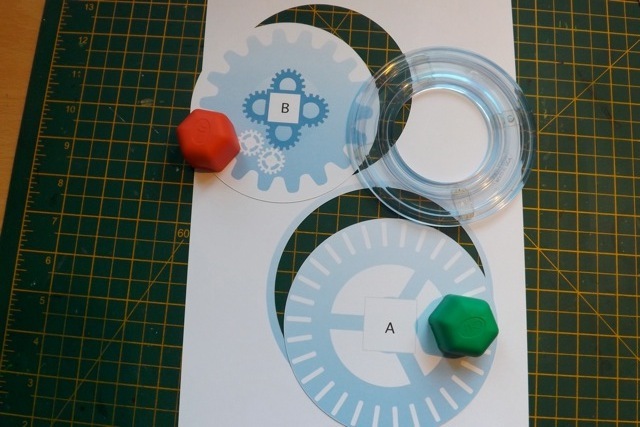 You will note that the base unit also has the little instruction strip to stick on the flap so the recipient knows how to assemble it – not on the print I photographed. You really want to cut them out of heavy cardstock (and they should print just fine on white or even very pale blue Bazzill – the textured surface looks great) but you can also print them on heavier printer paper then cut a second plain circle (white or coloured) and layer them to keep the shelves from going floppy. 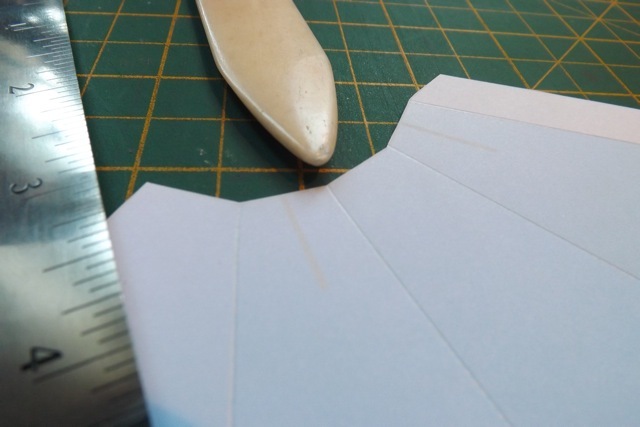 Cut out the base, and score and crease along the very faint lines. The lines all but disappear at the top, but the little dip that defines the top edge can be easily seen. 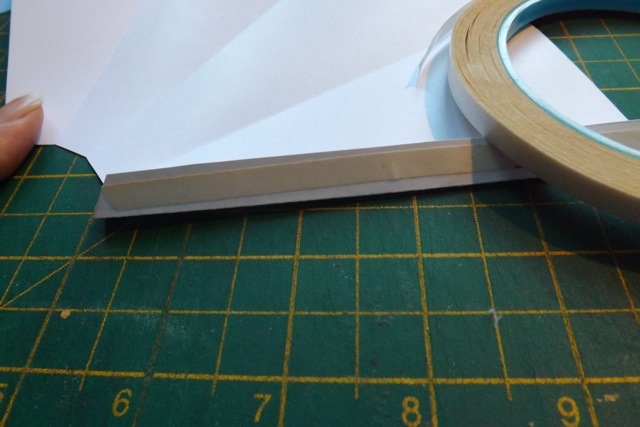 Add the strip of BACKED double-sided tape and do NOT remove the backing, unless you plan to present the card assembled! Cut out the centre squares. 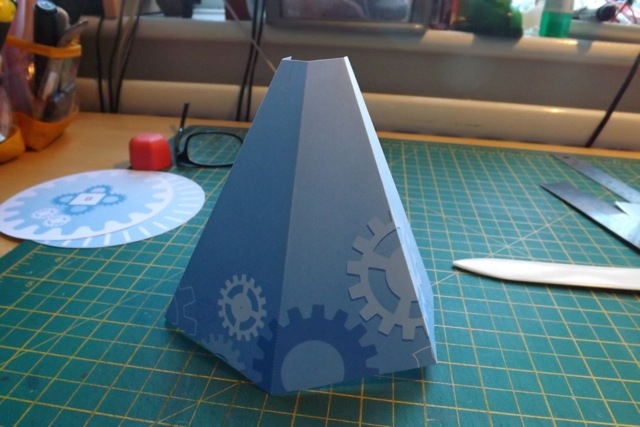 Try to be accurate – too big or too small and they might not sit properly on the base. You have a tiny bit of wiggle room but not a ton. Cut the slits. I cut either side of the printed line, so the topper fits easily. But again, don’t get carried away. 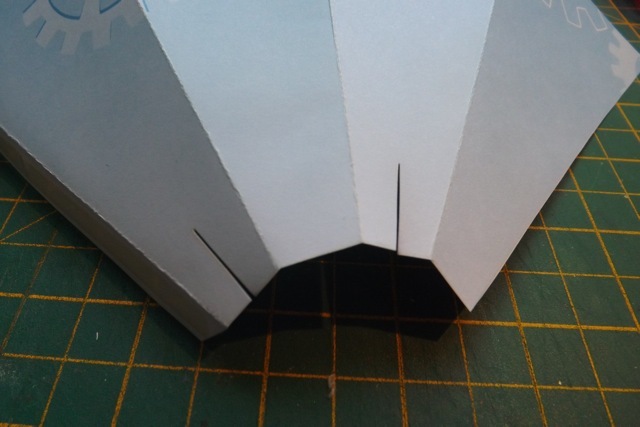 If you DO cut the slit too wide, just add a chunk of cardstock at the back of the topper. You don’t have to, but I inked the edges, just to really disguise the faint lines. I like to pop-dot the topper, just so it stands out a bit. 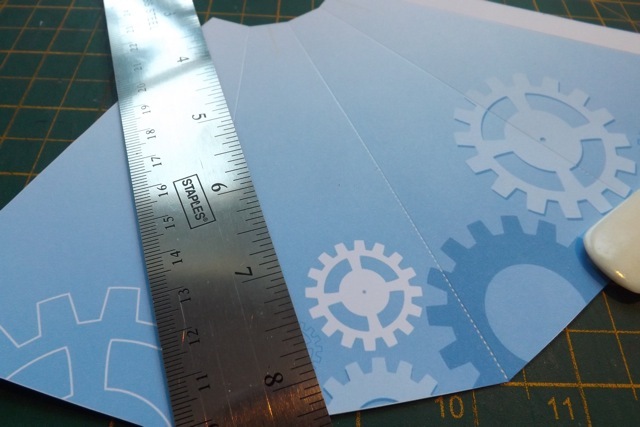 If you are into hand cutting, feel free to cut around the gears, or figure out how to make your cutting machine cut out the top shelf. 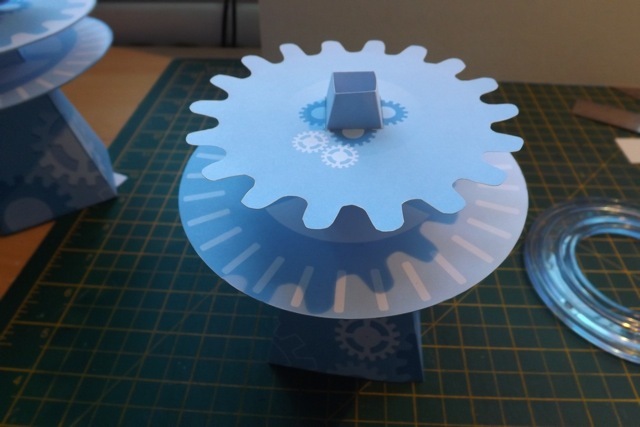 I like that too – a previous version, with smaller gears – the PDF has the bigger ones. Now, you can easily add a greeting around the front edge of the shelf, as I did in the original card, and replace the topper (or layer over it) a lovely family photo. I think there are just many ways you can customize this. 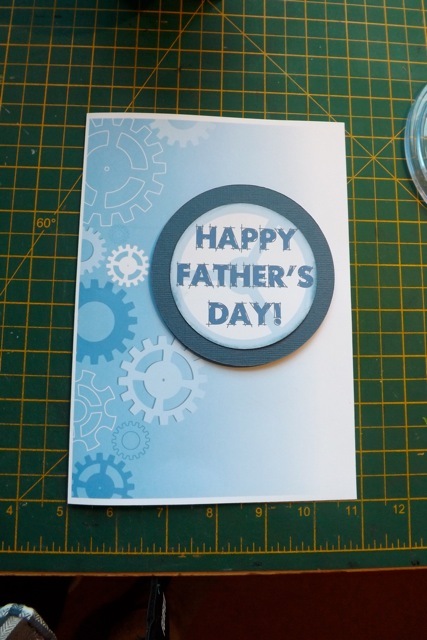 Categories: cards, downloads, printables, tutorial | Tags: cards, how-to, printables | Permalink.